What version of the Bluetooth standard does my computer / laptop / tablet support? 1) First we need to open a “Run command” box. On any fairly modern Windows computer there should be a Windows Key on your keyboard. Press Windows Key + R. If this doesn't work or you can't find the Windows Key just go to the start menu and you should find a Run link near the bottom of the list of options. 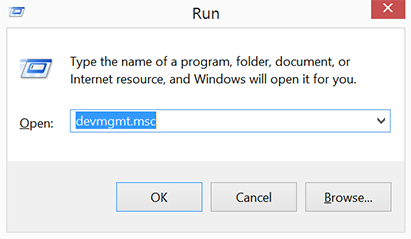 2) In the Run Command window type devmgmt.msc and then press enter. If you are now prompted to confirm this step due to the Windows security settings on your computer just click the Yes button. 3) In the Device Manager expand the Bluetooth category of items. Look for the Bluetooth adapter device. It’s name will vary depending on your exact hardware but it will usually refer to something such as "Bluetooth Radio" or , "Bluetooth Adapter". 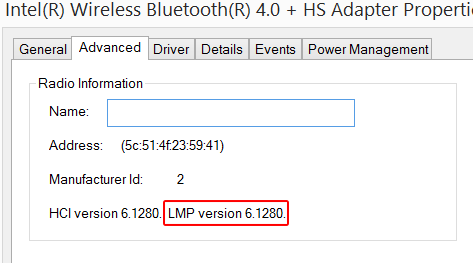 It may also actually list the revision of the Bluetooth standard it supports (as in the screenshot below). If that is the case you can ignore step 4 as you have your answer! If you're having problems locating the correct item from the list one thing is for certain; the item you need to locate in the list will not contain the word Enumerator, so ignore all such entries. 4) Double click to open the properties of the device you believe to be the main Bluetooth adapter. You will know straight away if you are in the correct item as you should see an “Advanced” tab with contents like that shown below. 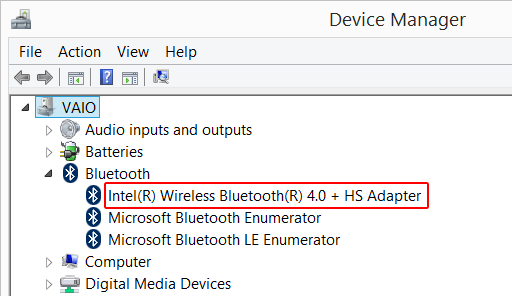 Is your adapter supporting a Bluetooth revision much lower than the current 4.0 / 4.1 specification? If it is then using a new Bluetooth adapter in your computer may help improve reception. If you are using devices that send a lot of data such as constant streaming audio or video then you really want ensure that both adapter and device are at least compatible with Bluetooth version 3.0 + HS. If for some reason you were not able to determine the Bluetooth revision supported your computer click here for some other ideas. Is your adapter less than the current 4.x specification? Whilst there is no guarantee that this will resolve the problem you may want to consider upgrading your Bluetooth adapter. If you experience bluetooth related problems with your iOS device it could be due to it's vicinity to USB 3 or other electronic devices producing electrical interference so the first thing to do is to try your Bluetooth device with the iOS mobile/tablet in different locations and away from anything you know could interfere. If you are experiencing connectivity problems then maybe our general troubleshooting tips can help.